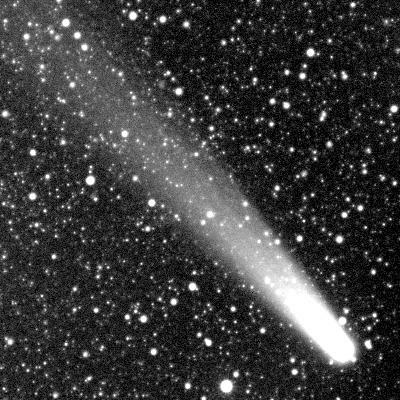 Comet C/1996 B2 (Hyakutake) at 02:38 UT, April 9, 1996. North is up, east is left, and the field of view is about 3 degrees square. This image is a composite of six 5-s exposures with a Photometrics CCD camera (Thomson 512 CCD) and Robert Reeves' 135-mm Nikon lens at f/4, using the 0.4-m telescope at Limber Observatory as a tracking platform. The bright star to the lower left of the head of the comet is the eclipsing binary Algol (beta Persei), near maximum brightness when this picture was taken.